From feature films to gaming to publishing, professional animators work in a variety of exciting positions. The U.S. Bureau of Labor Statistics projects that positions for multimedia artists and animators will grow 8% from 2016 to 2026. This 10-year increase translates to around 6,200 additional jobs. Most online animation programs take four years to complete, and graduates will leave school prepared for work in the field. 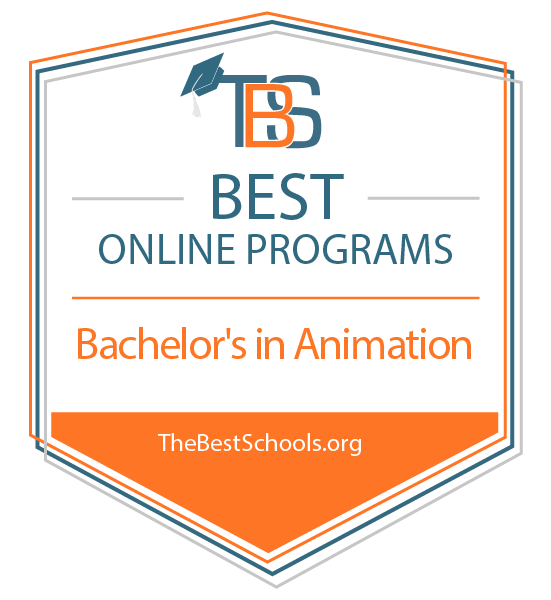 Online Bachelor's in Animation Degree Program Ranking Guidelines: We selected the degree programs based on the quality of program and range of courses provided, as well as school awards, rankings, and reputation. Through asynchronous learning, this computer animation degree online program requires students to complete 13 sequenced courses centered on 3D graphics and animation. The program primarily uses the teaching application MAYA from Autodesk. Core and foundational courses in the BFA cover 2- and 3-dimensional design, color theory, and art history. Note that the DAC accepts students for the BFA in visual arts in the fall semester only. At the end of this computer animation degree online program, students create a portfolio that demonstrates their mastery of the discipline. Through this online animation degree, students develop proficient skills in Adobe Creative Suite, Maya, and Mudbox. SNHU delivers more than 100 online bachelor's degrees, and offers a generous transfer policy to prospective students. Through Baker College's BS in game software development, students gain skills in software engineering and animation. As with other online animation degree programs, this bachelor's of science explores leading technologies and the entire creative process from conception to final production. While the program's focus is on game development and programming, the skills are applicable to all types of animation, platforms, and industries. The major itself is 90 units and includes such courses as visual BASIC, programming in C++ and Java, and game design and analysis. In their final year, students in Baker's computer animation degree online program complete a senior design project that they can eventually use as part of their portfolio. Though the online animation degree program enforces deadlines and start and end dates to terms, participation is asynchronous; students log in, study, and collaborate at their convenience. Baker College is regionally accredited by the Higher Learning Commission. Online animation degree programs cover the animation techniques used today and in the past. Courses cover visual artistry and other aspects of the storytelling process. A computer animation degree online program educates you on animation for film, gaming, and the digital space. Through core classes, you’ll review topics like figure and animal drawing, character gesture, cutout design, color theory, and developing a narrative. In most programs, the first two years focus on the principles of art and the different ways to use content, medium, and form to tell a story prepares you to choose a specialization like game design, character animation, or computer graphics. Through electives, you can tailor your online animation degree to match your career goals. A future storyboard artist, for example, may take advanced courses in screenwriting. A future character designer, meanwhile, may focus on character ideation and creation. As part of the curriculum in most online animation degree programs, you also periodically submit work for review, and your studies culminate with a "thesis film" or a final creative project that demonstrates your mastery of program competencies. Details of online animation degree programs may vary depending on the school and program chosen. Given the importance of specialization in animation, programs tend to feature different concentrations. All strong computer animation degree online programs combine the in-demand skills needed to compete in the industry while also teaching a solid foundation in traditional and contemporary art. This introductory course provides an overview of the principles and types of animation. Students explore traditional and contemporary techniques, the media from the past and present, and the various media you may work in, like pixelization, cutouts, and clay for stop-motion. In this course, students learn how to build a 3D character from scratch. Topics cover what it takes to work in 3D modeling and render a three-dimensional figure for VFX, from aesthetics to the technical side. This survey course explores changes in animation over the decades. Students study the origins of animation forms, plus the theory and criticism of styles, movements, and techniques that animators may or may not still use today. Students learn the terminology and basic concepts of computer graphics. Through this introduction, students gain a better understanding of 2D and 3D animation and how film, games, and the publishing industry use computer graphics to tell stories. This course explores how to use editing for animation, which differs from cinematic film. Students become proficient in using today's editing software, including synching, editing digital video, and adding, removing, or editing audio files. With an online animation degree, you can pursue creative roles in various industries, including film, advertising, and gaming. According to the BLS, the biggest employer for multimedia artists and animators is the motion picture and video industry, followed by computer systems design. The third biggest industry is software publishing. By developing multiple skills and honing your craft in a specialization, you can prepare yourself well to compete for a variety of positions. Art directors work in a supervisory role on art projects. They develop the visual style and vision for a project and then allow staff to turn concept into reality. In the animation field, they may storyboard an entire film, game, or campaign before turning it over to the animators and actors once a project enters the production phase. Animators will find ample opportunity to work in the gaming industry, with BLS identifying this industry as the second-largest employer of animators today. In terms of their daily tasks, game designers create all aspects of a visual story, including the scenery, backgrounds, icons, and characters. Game designers conceive the look, feel, and layout of a studio's games. With a background in animation, you can work as a computer graphic designer. Computer graphic designers use the same approach as animators for conceptualizing and creating characters, layouts, or settings. Computer graphic designers work in various industries, and their animation and design skills complement projects in film, advertising, media, and websites.